In coming months, Duke’s faculty and staff presence in downtown Durham will increase as part of efforts to spur innovation and entrepreneurship. Photo by Duke Photography. Echoing through seven floors of a vacant, historic building, sounds of saws sheering through metal and the clanging of hammers filled one of downtown Durham’s biggest renovations projects. Open windows and entryways at the 68-year- old Liggett & Myers cigarette factory, now The Chesterfield, allowed the sounds to spill onto North Duke and Main streets, an audible cue of the future for the city – and Duke. 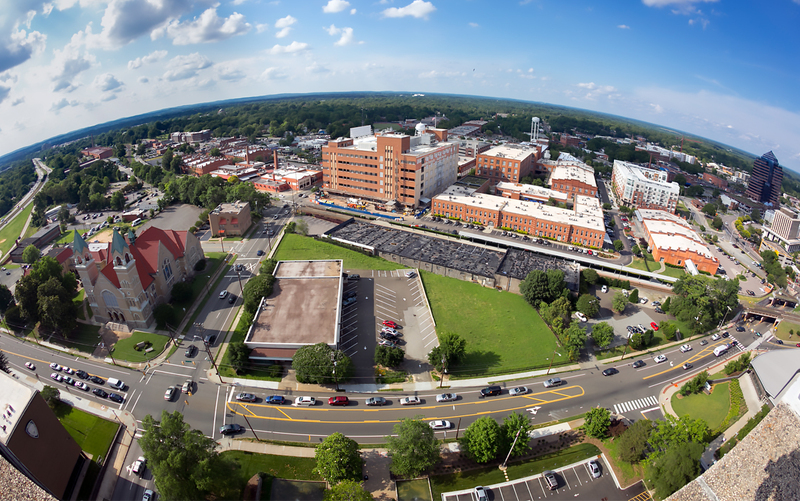 The economic and cultural renaissance of downtown, supported by $1.2 billion of private and public investment since 2000, is showcased perfectly in The Chesterfield, where Duke will lease about 100,000 square feet for engineering and medical research. The Chesterfield, billed as a centerpiece of Durham’s life science community, is set to open in January 2017 with a goal of spurring ideas and products that may change the world. Duke has had a downtown presence since the 1970s with Duke University Press employees at Brightleaf Square. During the past five years, the number of Duke employees working downtown, from Brightleaf to the American Tobacco Campus, has increased from nearly 2,000 to 3,500 and will continue to grow even more. As Durham continues to evolve as a city, the collaborative nature of science and technology is getting a boost from the collection of faculty and staff moving downtown. 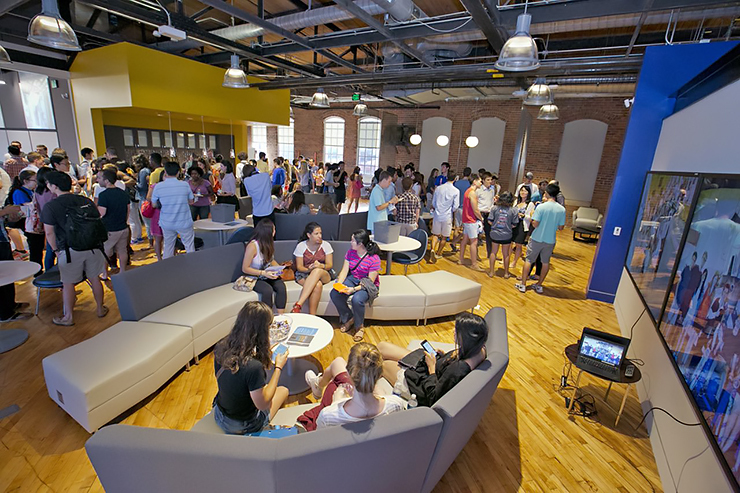 Duke community members meet and mingle during the grand opening of The Bullpen in August 2015. The space acts as one of Duke’s main hubs for innovation and collaboration between students, faculty, staff and community members. In August 2015, Duke’s Innovation & Entrepreneurship Initiative (I&E) moved into a downtown Morris Street tobacco building built in 1916. I&E’s office, The Bullpen, is a focal point of the university’s innovation and entrepreneurship efforts and foreshadows Duke’s involvement in Durham’s growing Innovation District, a span of 1 million square feet across 15 downtown acres. The Bullpen provides just under 13,000 square feet of workspace for collaboration among Duke community members and Durham’s entrepreneurs and organizations. In May, it served as a meeting space for Moogfest, a gathering of artists, entrepreneurs, futurist thinkers, musicians and engineers. Since opening, The Bullpen has connected disciplines spanning social sciences, law, anthropology and medical research. Duke community members, including students, have used the space to dream up projects from a sensor that detects displacement of a runner’s heel to an antiperspirant hand lotion. “You come for the space but stay for the collaborative possibilities,” Della Pia said. It’s a lesson learned by Tatiana Birgisson, a 2012 Duke graduate who, as a student, founded the energy drink company MATI Energy with the help of I&E and stayed in Durham because of the entrepreneurial spirit she found at The Bullpen. That’s a tangible outcome seen by Nicholas Katsanis, the director of the Center for Human Disease Modeling and Jean and George W. Brumley Professor of Cell Biology and Pediatrics. Since moving into downtown’s Carmichael Building at 300 N. Duke St. a year ago, he has harnessed partnerships with other Duke faculty. 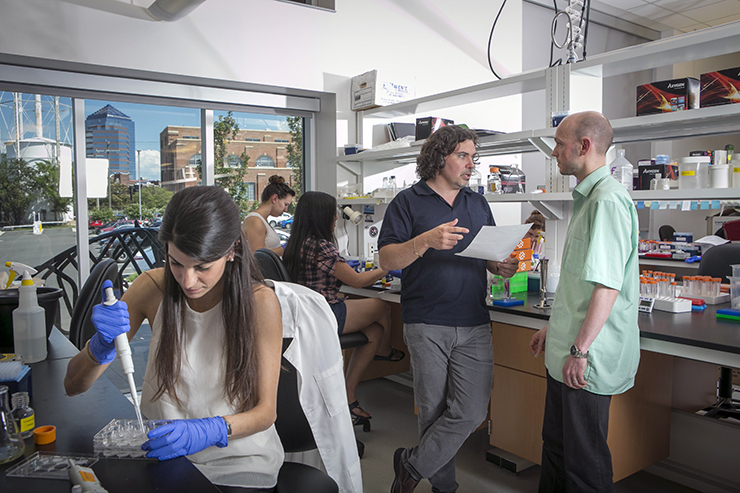 Nicholas Katsanis, center in black shirt, discusses research plans with a colleague in his downtown lab space located in the Carmichael Building at 300 N. Duke St.
On campus, Katsanis was far away from peers in the Duke Molecular Physiology Institute, but now he’s sharing labs and space with fellow researchers in Carmichael, allowing for daily conversations and connections. By sharing close proximity, Katsanis and his faculty have been able to accelerate several research projects on disorders such as glaucoma. He’s also in the early stages of a startup, Rescindo Therapeutics Inc., which focuses on accelerating drug target discovery for genetic disorders. With the potential to meet academics and non-academics alike within walking distance of his lab space, Katsanis said an important benefit of being downtown is simply having the chance to share information about what he and Duke are up to. 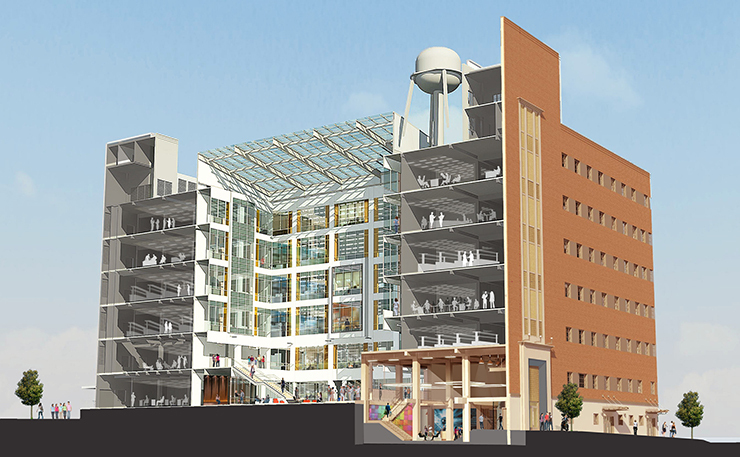 A rendering of the Chesterfield shows a glimpse of what the inside of the seven-story Chesterfield building will look like once completed in 2017. By 2017, Duke faculty and staff will take up about 1.3 million square feet of space across downtown, and in 2018, Duke will take on 200,000 more square feet. About 55,000 square feet will be in a new 27-story high rise called One City Center and an additional 150,000 in a building being constructed across from The Bullpen near the corner of Morris and Roney streets. Tallman Trask III, Duke’s executive vice president, said that the university’s use of downtown space offers flexibility to grow and allows researchers and faculty access to work hand-in-hand with outside companies. Trask estimates that in the past 20 years, downtown Durham’s available office space has dropped to just under 5 percent due to an influx of businesses and entrepreneurs snapping up space and finding themselves working within blocks- if not feet – of each other. When Ken Gall, the professor and chair of the Department of Mechanical Engineering and Materials Science, moves into The Chesterfield next year, he’ll shift his office and lab space from campus’ Hudson Hall to about 6,000 square feet in the renovated building. Ken Gall, chair of the Department of Mechanical Engineering and Materials Science, will be among the first Duke employees to move from campus to the Chesterfield building. Once there, Gall may bump into staff from BioLabs North Carolina, a biotech co-working facility that will have 42,000 square feet in The Chesterfield. Gall said having close access to others is pivotal for research and ideas to flourish. 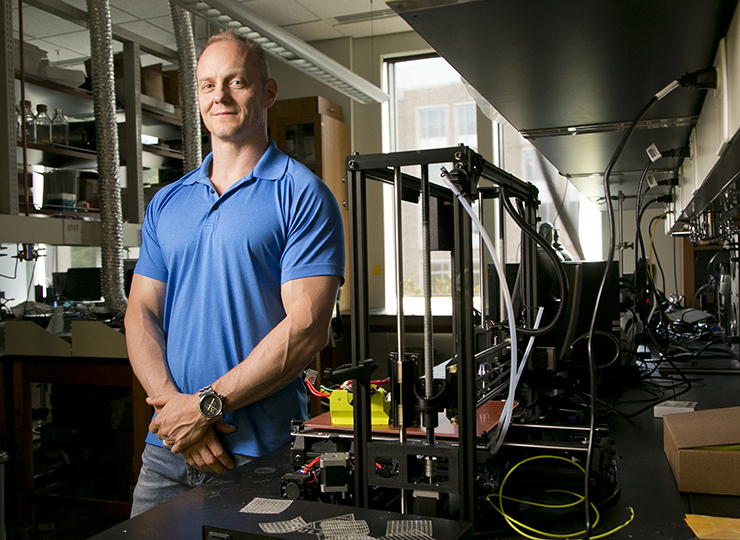 He’s founded two medical device start-up companies that have commercialized university-based technologies, experience pivotal to promote innovation and entrepreneurship among Duke colleagues. In Durham and elsewhere around the country, this marriage of academia and private enterprise is taking off. Cross-collaboration isn’t a luxury occurrence. More than ever, it’s becoming a necessity.